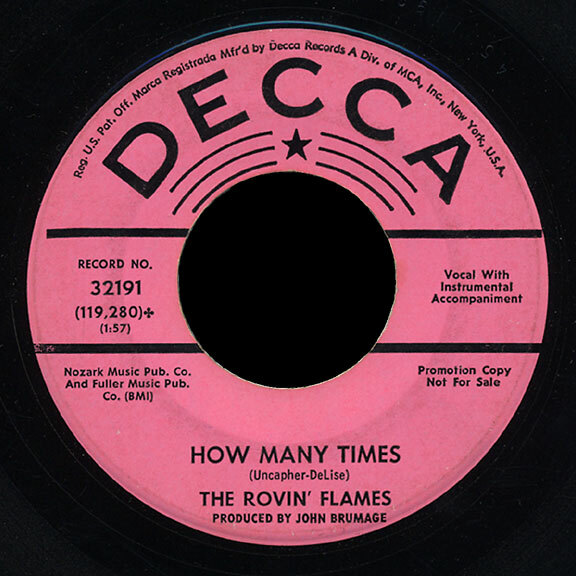 A 45 RPM vinyl record single of the song, "How Many Times," recorded by The Rovin' Flames for Decca Records in September of 1967. The song was written by John DeLise and Uncapher, produced by John Brumage, and published by Nozark Music Publishing Company and Fuller Music Publishing Company. The B-side is "Love Song No. 6." Original vinyl record, September 1967: Profiles: Bands & Artists, Tampa Bay Music Scene Historical Society. Digital reproduction of original vinyl record, September 1967. http://www.tampabaymusichistory.com/resources/RovinFlamesDecca45HowManyTimes.jpg. DeLise, John, Uncapher, and The Rovin' Flames. 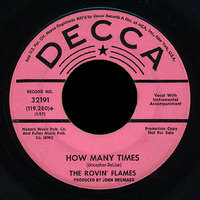 “"How Many Times" by The Rovin' Flames.” RICHES of Central Florida accessed April 24, 2019, https://richesmi.cah.ucf.edu/omeka/items/show/5495.